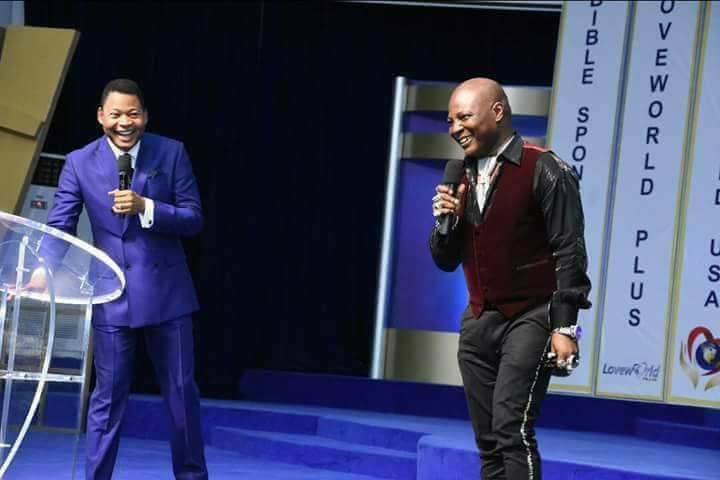 Singer turned activist Charles Oputa aka Charly Boy who recently got born again, after Christ Embassy Abuja regional pastor, Reverend Tom Amenkhienan ministered to him, came to church on Sunday to testify of his salvation experience. Charly Boy came with his wife Diane and other members of his movement. On Sunday, 25th February, Charly Boy had arrived Abuja from a journey and came straight to church from the airport with twelve members of his activist group. He returned for an exclusive meeting with Reverend Tom on Tuesday 27th February, in the company of some members of his group. Reverend Tom then ministered to him privately, and he accepted Christ and was born again. Charly Boy was all smile and moderately dressed as opposed to his loud styles. He was given the microphone and he testified of his salvation. He was joined by members of his movement and his wife as he spoke of his salvation experience.